Does Australia's international perception matter? Spying, Climate Change avoidance, and VLAD: Australia's message to the world. I've been thinking a bit about the international perception of Australia recently. A catalyst may be I am now living in Tokyo and, therefore, being in a foreign land I am a little more receptive to events which may impact on Australia's international standing. The focus of this post is three recent events: Spying, Climate Talks, and Queensland laws targeting groups. I'm not suggesting those things carry more weight than other matters, such as Australia's aid response to Typhoon Haiyan. Rather, I have selected these three as they display different facets of Australian politic: the security apparatus, Australia's participation in international forums, and the possible international impact of State based laws on international perception. 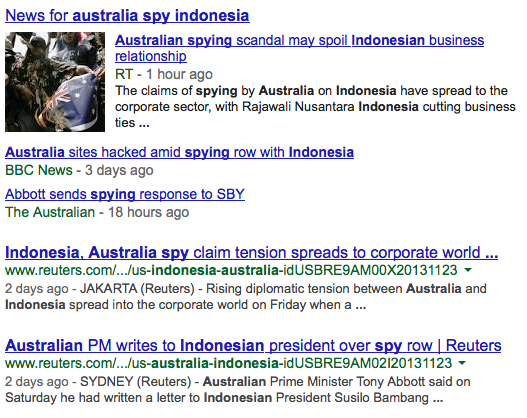 The issue of spying on Indonesia certainly made international headlines (Figure 1). Spying has been in the press for a while since the Snowden relevations with regard to the monitoring activities of the United States of America National Security Agency. It was documents from Snowden which revealed Australia's spying of Indonesia. I don't think the question is whether nation states spy on one another as I think the spying is necessary in a world of competing nation states. I also don't think the question is who was the target of spying as each person was in a position of influence (noted here). I think the question is how the Government has responded to the issue, something Tim Bashera asked in an excellent set of questions on Twitter. Do you think the way the Government has responded is appropriate? What impact do you think it will have on our international standing? Moving onto climate change, the Australian Government decided to not send ministerial representation to the recent climate talks in Warsaw. Even though our Prime Minister is on record as saying science on climate change is "crap", and has tasked the Environment Minister to dismantal existing arrangements, I was surprised the Government didn't send a minister. Granted these climate change talks seem to be just that, talks, with each developed nation doing what it can to obfuscate and kick the can down the road hoping somebody else moves first, these talks are important to be part of. The reason is global trade is dependant upon economic growth, and many countries such as China, India, and the European Union are investing significantly in climate remediation and creating markets. Would it not be a good idea for Australia, if not in the same tent, to at least in the same general area as these countries and markets for stuff Australia produces? Lastly, lets consider the Queensland State Government's Vicious Lawless Association Disestablishment (VLAD) laws. Introduced under the guise of protection from those 'evil bikie gangs', it has set a disturbing precident for other bills such as one being introduced to cover "out of control parties", which consists of three or more drunk people in a group of twelve in a public area. Given tourism is a major contributor to the Australian economy (4.9% of GDP 2011-12), what will these laws mean for Queensland as the sunshine state which loves to market itself as a tourist destination. Will interstate motorcyclists be less included to cross the border and visit? Will schoolies have to be relocated (Tasmania - opportunity!). From an international perspective, what about large groups? Will Queensland no longer be able to host an international cricket match involving England lest they potentially have to lock up the Barmy Army! With just these few examples do you think they have negatively impacted on the international perception of Australia? Does Australia's international perception matter? The title image is a composite of this image by Emery Allen licenced through Creative Commons, this image by Climage Safety licenced through Creative Commons, and this image by Doug Jennings licenced through Creative Commons.